My palms are sweating. My heart is racing. My stomach is in knots. Sounds like I’m getting ready to give a speech in front of a bunch of people, right? Actually, no, I’m just going to a Christmas party held by one of my coworkers. 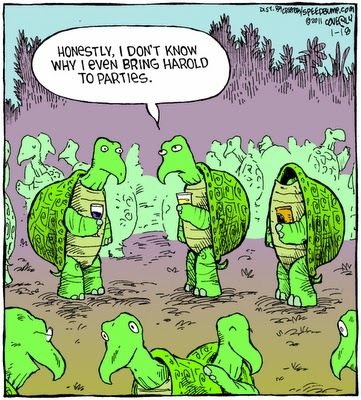 Parties are supposed to be fun, right? Wrong. When you’re a natural introvert who suffers from a touch of social anxiety like I do, the idea of going to any social gathering with more than say eight people is terrifying. Most people who know me would probably never guess that I feel this way because I like to think I’m good at hiding it. Yes, I’m an introvert, but I’m not shy; like most things in life, introversion and extroversion lie very much on a spectrum & I believe I fall on the more liberal side of introversion (in other words, close to the middle). I love talking to people, anyone really. But I thrive on one-on-one or small group conversations. That’s where I shine. And I require a certain amount of alone time in order to stay sane. Put me in a group of more than roughly eight people and suddenly I feel like the same old awkward teenager I used to be, the one who never knew about all the “cool” TV shows and music that everyone else knew about and who was generally out of the loop about just about everything. I’m not that person anymore and I know it, but there is still something about being in a larger group of people that just sends off firecrackers in my brain. And not the good kind of firecrackers. The kind that say “Run away! This isn’t safe!” I might not really act like the turtle with its head in its shell, but deep down I’m often feeling that way. This must sound totally ridiculous to those of you reading this who thrive on large groups, parties, clubs, and all of those supposedly fun things. I on the other hand hate crowds and any sort of social situations that do not lend themselves well to intimate or deep conversation. (Hint, intimate does not have to mean sexual, despite our society’s tendency to equate one with the other.) Hell, the idea of going to NYC and walking around those crowded streets makes me feel like my throat is closing up and I can’t breathe. I’ve even realized that I have this same type of anxiety around my own family, if a gathering consists of more than say eight people. I know that must sound so silly. But it’s true. Perhaps the reason for this is that when you put 20-30 people in a house together you rarely have meaningful conversations with anyone. You just say “Hi, how are ya?” and other such trivialities to everyone. I for one long for so much more. Yet I love having a big family. Argh. I am coming to realize that my mind is a mass of contradictions. For example, I actually love hosting cook-outs and other casual “parties,” and yet the idea of attending one that isn’t composed of my closest friends inevitably causes me to have a mild anxiety attack. I don’t have this problem when I’m around a lot of people at work or in class. I think I handle those kinds of situations quite well. I also am not afraid of giving speeches, teaching a class, or taking on leadership roles at work such as charge nurse. I actually ENJOY all of those things! But there is something about pure SOCIAL situations that still scares me if there are too many people involved. I don’t really know why I’m writing this other than to make myself feel better for being so “uncool” as to have a mild anxiety attack about something as silly as going to a party, something that most other people would be excited about. The truth of the matter is I had a decent time at the party. I almost always do. But I still get anxious about these kinds of scenarios. And deep down I’d always rather spend time with people alone or in very small groups. If you’re reading this and you can relate to what I’m saying, feel free to comment so we can all feel less alone. As a further aside, I should add that I have at worst a mild case of social anxiety. I know there are people out there who suffer far more, or perhaps I should just say differently, than I from social anxiety. I don’t mean to say my experience is representative of everyone with social anxiety issues. I just wanted to share my own story. I can definitely relate. You go to these gatherings because you’re supposed to or because you don’t want to be anti-social, but they wear you out. Very much so. You out on a smile and the small talk and it’s so…..exhausting. You need time alone to think and to be quiet for a while so that you can “re-charge.” We do what we have to do. I’m both introverted and shy. Can you believe I used to teach? Every semester, for the first few weeks, it would be the same struggle to get in front of the class. So, no, you are definitely NOT alone. (I have other introvert friends, too.) And you are definitely normal. My guess is some of us are more sensitive and cautious and we evolved this way to protect ourselves from the unknown in people and places. :). Great post. Thanks so much for sharing! And incidentally, I think teaching kids/teens would be way more intimidating than teaching adults! You and I are so similar, it’s not even funny!! presentation but I find this matter to be actually one thing which I feel I might by no means understand. Well, writing helps keep me sane b/c it helps me make sense of a confusing world and my own confusing brain. Thanks for reading!